Ahead of our upcoming webinar panel discussion, we explore the three questions every people leader should ask before launching a successful HR initiative. 2018 has obstacles ahead: leading your people, becoming a strategic business partner and nailing initiatives to drive the success of both parties. A large part of the challenge is shifting away from procedural tasks (keeping the organisation and its employees ticking over) towards proactive, mission-focused action (to better the lives of employees and boost business performance). But there’s a hitch: before any of this can happen, HR must first secure the confidence of those at the top. We call this leadership buy-in, and have come up with a few questions to ask yourself to help you get it. 1. How do I add value without increasing line managers’ workloads? ‘Strategic business partnership’ is a piece of business jargon that clouds a simple pursuit: relieving pressure from management. In order to do this, HR needs to think of its target audience – employees and managers – as customers. Good marketers and designers obsess over the customer and user experience with the aim of making it as easy as possible for the target to buy or use their product or service. HR should in turn concentrate on making all of its initiatives – learning and development, reward and recognition, hiring and relations – clear to its target audience. People leaders must educate the company as to why the initiative is important, and explain how they can take advantage of it. For example, this could mean introducing technology for on-demand learning, rather than pressuring staff into attending inconvenient away days. 2. How do I analyse workforce performance, and identify areas for improvement? In essence, this question challenges the people department to become evidence-based; to act on the advice of data and become more considered in its approach. Analysing business performance goes far beyond the study of individual talent – it’s about reviewing every area HR has a hand in: pay and benefits, learning and development, talent management, and so on. Measuring workplace performance is a team sport. The metrics you use should be agreed with your CEO, COO, and any other concerned party. Therefore, if the answer to this question is unsatisfactory, the responsibility goes beyond the HR department. Agreeing on the performance data isn’t passing (or sharing) the buck, it’s about ensuring time and resources are best used. 3. How will my desired initiative add to the bottom line? Rather than administering initiatives on your customers – employees and managers – HR teams must work out exactly what the organisation needs to succeed. The challenge is finding meaningful metrics that are linked to business outcomes – information that proves organisational agility, capability, innovation and, ultimately, revenue. Explore the cost of not introducing your initiatives, and how it would continue affecting productivity, absenteeism, presenteeism – or whatever you’re addressing. Ready to take your plans to the boss? 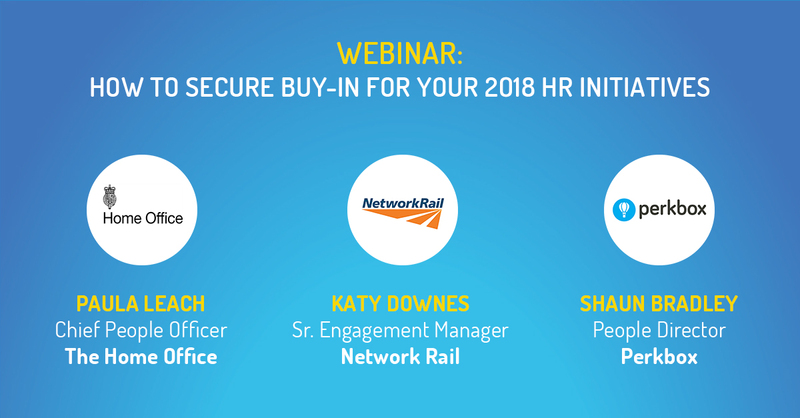 Register now to join us on Wednesday 31st January as we host a live webinar panel discussion featuring expert practitioners from The Home Office and Network Rail to explore how to secure buy-in for your initiatives.